Variety of question types: Multiple choice, rating etc. Call us 800-826-0357 or Click the Button Today! How can companies maximize their employee’s productivity, create a superior customer experience while saving thousands? IVR Lab creates innovative Interactive Voice Response Systems (IVRs) and Customized Conversational Computing solutions like chatbots and AI driven Virtual Assistants that let you do just that. 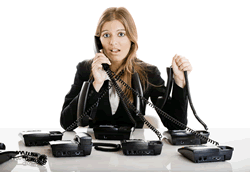 Our Advanced IVR System and Automated Attendants act like a virtual receptionist. Our cutting-edge systems can be used for making or receiving Routine Calls, Market Surveys, Retrieving Account Information, Bill Pay or Sales Calls. Customer experience can be enhanced by AI based technology such as Chatbots, Virtual Assistants and more. We are experts at designing highly customized Interactive Voice and SMS Response Systems. Big project or small one, when others say no, we’ll say YES! Chatbots and virtual assistants can utilize a combination of technologies like speech recognition, test to speech, NLP, machine learning among other things. This new technology will get your messages directly to your customers voicemail – without their phone ever ringing. Call us to broadcast your message! SMS has a much higher open rate than emails. Our SMS based surveys can be used to get feedback quickly and affordably. Take advantage! Use our massive calling capacity to get your message out to your constituents. Great for HOA meeting & Employee notifications too. IVR Lab offers one of the most powerful, flexible and reliable SIP trunking solutions on the market. Unlimited and Scalable Trunking available. Set up offices remotely quickly. Get local and Toll-Free phone numbers in every country you do business and forward them to one location. Most numbers are available for 100 countries and counting. SMS option available. ROI in Weeks, not Years! Utilizing an IVR can result in substantial Cost Savings as employers can apply employee resources to much more productive work, while still meeting their client’s needs. Automated systems work 24 hours a day; 7 days a week while incurring zero labor-costs. With IVR and other automated services, your Return on Investment is clear, tangible and quick. Let us show you how we can streamline your business processes, while cutting costs. As technology evolves, companies are finding that traditional methods of communicating with their customers are simply not enouigh. This is why hundreds of companies have started using AI (Artificial Intelligence) and Natural Language Processing (NLP) based services to better serve their customers. This not only enhances the customer experience, but also adds to their bottom line. Our Cognitive Solutions and IVR Systems are fully customizable to each client’s particular needs. Our Advanced Solutions allow for highly configurable call-flow suited to your specific business goals. Additionally, all the customized solutions we implement come with our guaranteed customer support. Make Voicemail drops without ringing the recipient’s phone! Wherever you are located, our custom IVR systems can provide callers with information extracted from local and/or remote databases (such as Account Information, Telephone Banking or Bill Pay); with functionality to transfer calls to a live agent or other extension. We can also create complex surveys, phone based quizzes, health information surveys and much more. We use cutting edge technology from industry leaders such as IBM, Amazon and Google to implement advanced AI based chatbots that converse naturally with your customers, while solving their problems. Chatbots are able to communicate via various means, inclulding voice, web chat, SMS, or social media. Whatever Customized Solutions you’re looking for, contact IVR Lab today. We’ll work with you to determine the best for your business and customize it to your particular product, service, website and database. You’ll save thousands and enjoy the Best ROI using our technology. Please use the Contact Form at right to have one of our solution experts call you for a no-obligation initial consultation. We look forward to helping you meet and exceed your Business goals. If you're in healthcare, you owe it to yourself to learn how you can make your everyday business processes more efficient and save money at the same time. We can help in automating many of your routine and repetitive tasks. If you're in the transportation business, you can automate many of your routine tasks like package notifications, surveys, collection calls and more. Improve your customer satisfaction by extending your service hours without extending your costs.